DETROIT, March 18, 2006 (PANW)--Hundreds of people gathered in downtown Detroit on Saturday afternoon to protest the 3rd anniversary of the United States invasion and occupation of Iraq. Beginning with a rally at the 'Spirit of Detroit' statue outside the Coleman A. Young Municipal Center, several speakers denounced the ongoing American involvement in Iraq demanding that the troops be brought home immediately. This demonstration took place in conjunction with similar events held in over 700 cities throughout the country. In addition, marches and rallies were staged in more than 40 countries around the globe. In Detroit, the focus of the demonstration centered around the impact of the war policies of the Bush administration on the budget deficit in the city. In a poster circulated announcing the march, it stated that over $400 million dollars of city taxpayer money are spent each year to help finance the occupation of Iraq. In an opening statement at the rally, Abayomi Azikiwe of the Michigan Emergency Committee Against War & Injustice (MECAWI), the organization which called for the demonstration, stated that "we are a part of a mass movement. In over 40 countries throughout the world people are marching, demonstrating and holding vigils calling for peace now." Azikiwe, who is also the editor of the Pan-African News Wire, continued by emphasizing that "This war is illegal. We said this over three years ago. The Bush administration lied to us, they lied to the world, they told us that there were weapons of mass destruction in Iraq. Later they had to admit that their own pretense for going into Iraq was false. So why are we still there? We say that the United States Government is still there in order to exploit the oil in Iraq. They are trying to set up bases in the Middle-East to try to conquer the entire region. Well we cannot allow them to do this. We have to mobilize and we have to organize." 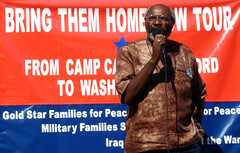 "Even the corporate media says that only 33% of the people in this country who have been interviewed say that they support what the Bush administration is doing in Iraq and not only in Iraq, but right here in the United States," Azikiwe continued. to bring it down. We have to have a people's government here in the United States, Azikiwe declared. Beheejah Shakur, a veteran of the United States military, who refused to fight in the first war against Iraq in 1991, spoke to the audience saying that "I protested the first Gulf War and they filmed me and had me on the six o'clock news. But I don't care they are still out there filming me, taking pictures of me and I am still protesting and will go on protesting. This war is insane. I told them at that time that I will go if you give me a card where when I pull up to the pump they will give me a discount. They didn't agree, so I said 'Hell no I won't go.'" Shakur went on to state that: "They are killing people in Iraq and not only Iraq but in Afghanistan. Next it will be Iran. In fact people are telling us that there are already service people on the ground in Iran as we stand here today. Iran is going to be the next big fiasco. Because that's all it is in Iraq, a fiasco. This country is not telling you the true numbers. You have no idea how many Americans are being slaughtered and killed and bombed, because they are only going to tell you a few numbers because they don't want Americans to know exactly what is going on." "In addition to all the American servicemen and women that are being killed, think about all the Iraqis. The elderly, the children, everybody is being affected in that country and it has to stop. Just a few days ago I was at a meeting of the Department of Community Health and they were saying that their budget was being cut. I told them that reason the budget was being cut is because all the money is going to Iraq and we need to stop it. We need to tell the president: we have had enough of this. We need to shut this country down and tell them to stop taking our money and sending it to Iraq," Shakur concluded. City water department employee Derrick Grisby also addressed the crowd saying that he is a prime example of how the war is affecting public sector workers. The city administration announced recently that 5% of the work force in the water department are being laid off. Grisby refuted the insinuation of Mayor Kwame Kilpatrick in his state of city address implying that absenteeism is too high and that employees will be punished for refusing to come to work. Grisby stated that "City workers are hard workers." "George Bush is a murderer. If you give the order to have someone killed here in America, you are just as much to blame as the one who pulled the trigger. This man has killed thousands and thousands of poor Iraqi children. There is a DVD we are circulating entitled: 'Fallujah, The Hidden Massacre', it's short and really documents some horrible atrocities committed by the military in Iraq," Grisby stated. Al Fishman of Peace Action and the Detroit Area Peace With Justice Network (DAPJN) took the bullhorn and expressed his appreciation to MECAWI for organizing this demonstration. "This is my second demonstration today because I was in Northville earlier where a demonstration was held with nearly 200 people in the heart of Republican territory. I think it is important to realize that there is a debate going on. There are some Republican candidates for Congress who are trying to run their campaigns as far away from Bush as they can. However, this does not take into account that each and every day that this war continues more Americans and Iraqis are dying. More people are being tortured and renditioned. At some point there has to be an accounting for these crimes. And that is the job of the American people." "When the war in Vietnam ended there was a great resistance to repeating this kind of foreign policy. When the president's father initiated the previous war against Iraq in the 90s the elder George Bush was heard saying 'we have kicked the Vietnam syndrome'. Well we are here to say to the people of the country that no you have not kicked the Vietnam syndrome or the Iraq syndrome either," Fishman concluded. A MECAWI student chapter member at Wayne State University, who had just returned from doing relief work in New Orleans during alternative spring break, discussed how people are still dying in New Orleans. Isis Sushiela, a graduate of Barnard College in New York pointed out that "we need to keep paying attention to what is going on in New Orleans. It is not in the news anymore. It is like a crisis that has come and gone. But it is not gone, it is still going on. People are being exposed to danger. It is the third most toxic site in the world right now. People down there still need your support. As long as the war is going on they are not going to get the money down there that is needed." Margaret Gutshall, a former Green Party candidate in the state of Michigan, encouraged people to run for office this year on a platform opposing the war. The crowd began to chant loudly: No War! No War! No War! No War! Addressing the burgeoning domestic crisis in the United States, Marian Kramer, a leader in the Michigan Welfare Rights Organization stated that "there are two wars going on: the war in the Middle-East and the war here in the United States. We are here today and every day to tell Bush to end this war. Bush talks about terrorism but he is the worst terrorist in the world. Its great for us to be out here today but we have to do this every day." "Let's get rid of the terrorists in Washington," Kramer said. "Let's stop the war here and stop the war on a global level." David Sole, the president of UAW 2334, and a leading member of MECAWI was the final speaker before the march began. Sole re-emphasized the national character of the demonstrations taking place over the weekend. "On this third anniversary of the Iraq war, a day of shame and infamy in U.S. history, the money that's being spent in Iraq is desperately needed here at home. People are getting their water shut-off and have no access to utilities. Their children are going to bed hungry. Many of these things can be solved with just a portion of the money thrown down the drain in Iraq and Afghanistan." Sole addressed the threats by the United States against Venezuela and other countries who are trying to build progressive regimes. "Isn't it interesting that the U.S. Senate is calling for an investigation of one oil company, you would think it would be the one that is raising prices, but instead they called for an investigation of CITGO, which is owned and operated by the government of Venezuela and they are being investigated because they have agreed to lower prices of heating oil for poor communities right here in the United States." "We say hell no to the war, hell no to the lay offs. Money for our cities, not for war. We are also marching against the threats to Iran for their desire to develop peaceful nuclear power. Washington is using the same language they used against Iraq. Hands off Iran. Stop the war before it starts," Sole concluded. At this point people went into the streets and began the march up Woodward Avenue. Even though MECAWI had been granted a permit to march in the street on Wednesday by the Detroit City Council, the police seemed to know nothing about it. According to Cheryl Labash of the Michigan Campaign to Free the Cuban Five: "Hundreds marched up Woodward Avenue in the street through the gentrified Detroit downtown. From old to young including disabled activists in scooters and wheel chairs, the crowd said, 'Bring the Troops Home, Now!' 'Money for Our Cities, Not for War.' The Jobs with Justice banner read 'make Jobs not War.' Detroit is the poorest major city in the United States. Michigan is the state with the highest unemployment rate in the nation. At the Martin Luther King Day demonstration police violated the marcher's permit, but today Detroiters took the streets although police again denied knowing a permit was granted by City Council." Labash continued by saying that "In Windsor, Canada(right across the river from Detroit) at noon, anti-imperialist demonstrators including a strong Lebanese delegation, called for an end to the occupation led by the U.S. Also at noon demonstrators protested the war in Northville, a Detroit suburb. Yesterday activists reenacted U.S. torture vignettes on the steps of the Federal Building, three people were arrested." Another participant in the demonstration held in Northville, a Detroit suburb, that was held earlier in the day, stated that "This war is clearly unpopular! Even in Northville public sentiment appears more pronounced against the war than for it. Probably between 150-200 people came out, very vocal, very crowd oriented- as in -reaching out to townspeople about the grave situation in Iraq . As usual, lots of solidarity in the crowd and complete unity around "Troops Out Now" as a central demand. Someone from the rally read off the names of the 78 Michigan fallen in Iraq. There was also someone from the ACLU who spoke out about violations against our civil liberties that are occurring across the country that they are currently fighting against. After a short rally, there was a march around town. About five, mostly younger, white males constituted an organized resistance. It was good for them to come out and see how outnumbered they are, both in comparison to us and among even Northville citizens. They garnered some, to minimum support I would say. At one point two cops strolled by and talked with some demonstrators, and then left. Uniformed police were not a large presence." The march concluded at Central United Methodist Church where a cultural anti-war program was held afterwards. The concert featured musicians Mike Anton, Scott Harrison, Dead Letter Office, Juan Jaunko & the Whale and poet Wardell Montgomery. This cultural event was coordinated by MECAWI member Kyle McBee with technical assistance from John Donabedian of the Detroit MLK Committee.